The district offers full-day and half-day preschool, and transitional kindergarten at every school site with an expanded age eligibility window (age 5 between September 2 and March 1). Welcome to the MPUSD Preschool Program. Our program incorporates several facets in order to best meet the needs of families in our learning communities. This website contains information about our different programming options and will aid you in choosing the program that best meets your needs. 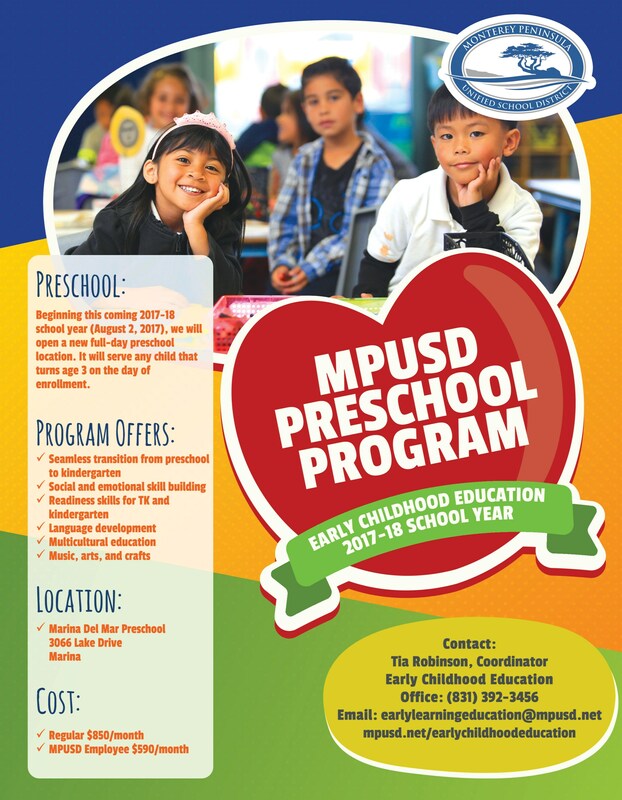 MPUSD is committed to providing enriching preschool programming and to supporting our families by delivering high quality learning experiences to children. As the Director of Early Childhood Education and Family Support Services, I am committed to your child and your family. I look forward to meeting you and assisting in the learning experience of your child. We are here to work with you as partners at this amazing and exciting time in your child's life. Bienvenidos al Programa de Educación Preescolar de MPUSD. Nuestro programa incorpora varias facetas para satisfacer mejor las necesidades de las familias en nuestras comunidades de aprendizaje. Este sitio web contiene información acerca de nuestras diferentes opciones de programas y le ayudará a elegir el que mejor se adapte a sus necesidades. MPUSD se compromete a proporcionar enriquecedores programas de educación preescolar y a apoyar a nuestras familias al ofrecer a los niños experiencias de aprendizaje de alta calidad. Como la Directora del Programa de Educación Temprana y Servicios de Apoyo a la Familia, estoy dedicada a su hijo y su familia. Espero con anticipación conocerle y asistir en la experiencia de aprendizaje de su hijo. Estamos aquí para trabajar con usted en esta increíble y emocionante etapa en la vida de su hijo. NEW! 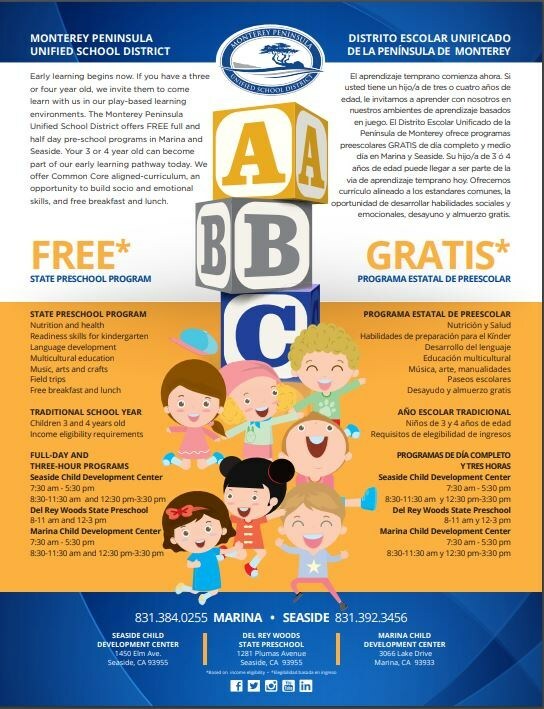 This program is our fee-based preschool offered in Marina. This program is in addition to programs at Del Rey Woods, Marina Child Development Center, and Seaside Child Development Center. Children turning age 3 on the day of enrollment can start immediately! Cost is $850 for community members and $590 for employees of the Monterey Peninsula Unified School District.